This web site is dedicated to my Dad, "Buck" Brener and all the guys he served with in Europe near the end of World War II. Buck survived the war and he died at home in Apple River, Illinois USA on 5 November 1995 of a heart attack. This summer (2000), while looking for something else, I came across an envelope filled with these old photos. I hope seeing these frozen moments from the end of the War will help the visitor to feel a little closer to the lives of those young men who did so much to to defeat the Nazis. Buck wrote on the back of nearly every photo and I have included my best guess of what he wrote there. Donald Maurice Brener, always "Donny" to his mother, was born in Shawano, Wisconsin USA near the end of the "Roaring Twenties" on 26 February 1926. His mother, Elvira Nelson Brener, "Vi", was a school teacher. His father, Maurice F. Brener, "MF", was the president of the Citizens State Bank. MF's father, Buck's Grandfather, had dropped one "n" out of the family name making all his descendents "Breners" instead of "Brenners." MF was also a veteran having served in France with the Wisconsin National Guard during the "Great War" in 1918. Just 3 years after Donny's birth came "Black Thursday", 24 October 1929, the New York Stock Exchange crashed signaling the beginning of the Great Depression. Donny was nearly 7 years old when F.D.R. was first inaugurated as President. Roosevelt would be the only President Buck would know while growing up. On 1 September 1939 Donny was just starting his seventh grade school year as the leaves began to change colors in northern Wisconsin. That day the Nazis unleashed their "blitzkrieg" on Poland and a few days later the Soviets invaded Poland from the East. England and France honored their treaties with Poland, declared war on Nazi Germany and the Second World War had begun. Back in Wisconsin, young Donny wore rode his bike, built balsa wood model airplanes and built "go-carts" out of scrap wood and old Maytag washing machine engines (they used gasoline engines in those days.) He went to a school where his aunt Olga Brener was both principal and next-door neighbor, planted trees on arbor day, hung out with the Menominee Indians on their reservation and rode horses. He wasn't allowed to participate in any sports because of the braces on his teeth. He loved practical jokes and was nearly always in some kind of trouble. He went to the movies, got his nickname from the 1940 movie "Buck Benny Rides Again." If any kind of mischief occurred around town everyone would just say "Buck Brener rides again!" He watched the newsreels and saw the war unfolding. In those years Shawano High School was a basketball powerhouse with coach Clifford F. Dilts. They were the Class B Wisconsin State Champions in 1938 winning 33-30 over Beaver Dam. They went 19-5 in 1941 and won the Wisconsin State Championship, beating Marshfield (13-7 coached by Jack Murphy) by just one point, 23-22. Shawano played in two more championship games, but lost them both.In 1942 Two Rivers beat them 35-28 and in 1943 it was Racine Park by the score of 40-23. However, Buck wasn't allowed to play on the team because his mother worried about the expensive braces he had to wear on his teeth. He became team manager instead. Buck listened to the radio nearly every day after school. Radio brought the whole world right into his house as if by magic. F.D.R. gave his fireside chats and there were broadcasts from the war correspondents in Europe. Then just weeks before his 14th Christmas, the Japanese attacked Pearl Harbor, Hawaii and the U.S. was in the war. Buck wanted to get into the war as soon as possible, but MF wouldn't agree to sign the Buck's enlistment papers until he managed to graduate from High School. Buck had a very hard time studying. He was sure the great adventure of his generation would end before he could get a part of it. In June Buck graduated from Shawano High School along with the rest of the class of '44. He immediately took the train down to Milwaukee in his race to enlist in the Navy. On the train down to the induction center in Milwaukee he met his friend "Chic" Schauder who couldn't get into the Navy. So the two of them decided to join the Army together. 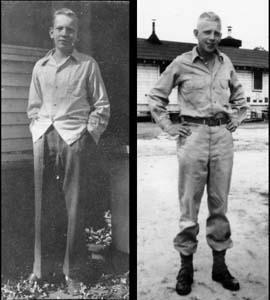 After getting his enlistment changed to the Army, Buck and Chic wound up assigned to different basic training camps. They didn't see each other again until after the War was over and they were back in Shawano. Buck did his basic training at Camp Stewart, Georgia in the heat and humidy of July and quickly discovered that adventures were not all they are cracked up to be. His new nickname was "Whitey" due to his very blond hair. That turned out to be just too easy for his drill sergeant to remember and it got Buck "volunteered" for a lot of extra duties. He earned a "sharpshooter's" medal with a rifle and was trained in anti-aircraft work. But the Luftwaffe was all but destroyed before he got to Europe and the Army didn't need any more anti-aircraft gunners. I remember Buck telling me that he sailed to Europe aboard on the Cunard Line's Queen Mary. She is listed as sailing alone out of New York on 12 October 1944. She was too fast to sail in a convoy and sped off alone. Buck said no U-boats were sighted, but everyone worried about being alone. She docked in Gourock, Scotland on 18 October 1944 with quite a load, 11,891 replacements & 1,061 crew. He said he was in [Northern] Ireland for a while then went ashore at Normandy. The quartermasters had laden all the replacements with lots and lots of spare spare clothes and equipment. They had to turn it all back over to the quartermasters once they reached France. They were just being used as delivery boys. Like about half of the Americans who served in Europe, Buck was sent to the Replacement Depot and then shipped straight out to the front as an individual replacement. Unlike the Germans and the British, the U.S. and the Soviet armies didn't pull their units out of the front line to make up their losses. Replacements were dribbled in as needed. The attrition rate for replacements was often 50% in their first three days in combat. That turned out to be just what Buck experienced. He and one other replacement got sent straight out to the front line. On their very first day there, the other new guy was shot and killed right in front of Buck. Buck had been ordered to the 8th Infantry Division's 28th Infantry Regiment, the "Black Lions" regiment, which was by then assigned the part of the "Ghost Front". It was a quiet section of the front lines along the Our River, which was the German-Luxembourg boundary. The Regimental headquarters had been set up in the small town of Grosbuss, using the local kindergarten. While visiting the Division, U.S. Army Chief of Staff General George Marshall presented the Silver Star medal with Oak Leaf Cluster to Lt. Col. (then Major) Donald R. Ward, 3rd Battalion Commander of the 28th Infantry Regiment, for courageous exploits on the field of battle. Buck told me on his first night patrol the squad was in Belgium in a coal yard filled with large piles of coal. They were attacked by a German tank and ran around behind a pile. He said he was so scared that he ran all the way around the coal pile and back out in front where the tank was firing its machine gun with tracers. When a tracer bullet is fired its phosphorus ignites and leaves a brilliant trail from the gun to whatever they are going. To Buck each one seemed to going right between his eyes. He froze in his tracks. Luckily the Sergeant felt sorry enough for him to go out in front and bring him back behind the coal pile again. Although trained at Camp Stewart, GA in anti-aircraft artillery, he was assigned to be a "scout" and spent much of his war behind enemy lines laying communication lines. Because of the weight of the spools of telephone wire, he wasn't allowed to carry an M-1 rifle. He had to make do with a carbine (4 pounds lighter). He said he never liked the carbine because of its lack of hitting-power. From what he told me I believe he almost certainly took part in some of the battle of Hürtgen Forest on the Belgium-German border in the Fall and Winter of 1944. It was a terrible and costly battle which the Allies "won". Historically it has always been overshadowed by Gen. Montgomery's "OPERATION MARKET GARDEN" and the Battle of Bulge. American soldiers moving in the Hürtgenwald. Click on image for larger view. Since their breakout from Normandy in August 1944, the Allied Armies had liberated France, Belgium, Luxembourg and part of Holland, covering over 450 km in less than a month. They had advanced in hours over the same ground that in the First World War had been fought over for years at cost of hundreds of thousands of casualties. They had been facing a thin line of the stubbornly retreating German Army that was unable to stand and fight against the overwhelming power of the Allied armor and air forces. They had also enjoyed good weather, excellent maps, aerial photography and free intelligence from friendly civilian populations all along the way who hated the "Bosche". Now all that was going to suddenly change as they tried to push their way across the border into the German homeland itself. In September General Hodges stated that given ten days of good weather the war might well be over. On September 15, General Bradley's aide Maj. Chester Hanson wrote in his diary, "Brad and Patton agree neither would be too surprised if we are on the Rhine in a week. Prepared the general's map for the next phase of operations which extends from Rhine to the city of Berlin. General anxious to slam through to Berlin. Marked a bullseye on Berlin." Intelligence had reported much of Hürtgen Forest was soldier-free and whatever units of the Wehrmacht might be found in it would be made up of recruits still in training and the "home-guard" of men unfit for to serve in combat duty elsewhere. They thought they Germans no longer had any tanks or artillery that could be used without being spotted and destroyed. They would be proven wrong. The Hürtgenwald ("Americanized" to the Huertgen or Hurtgen Forest) is a triangular shaped woods only 50 square miles in area on the German border near the point where Germany meets Belgium and the Netherlands, Ironically, it is nearly the same size as one of the "Happiest Places on Earth", Walt Disney World in Orlando, FL (47 sq. miles). The Hürtgen had its own nickname: "The Death Factory." Narrow roads with tight turns limited American tanks. Click on image for larger view. Mostly it was a state-owned tree farm. Fir trees had been planted in rows 8 to 10 feet apart and were now 75 to 100 feet tall. Some of the rows were so close together that the mature trees formed an almost impenetrable wall. Their low hanging branches were interlocked so that it was only possible to walk stooped over and visibility could be limited to only a few feet in any direction. It was also covered with deep gorges, high ridges, streams and rivers. The few clearings, narrow firebreaks and trails were heavily mined, covered by interlocking machine-gun fire and zeroed in on by German artillery. Any concentration of soldiers would bring down a furious barrage of shells and mortars. The German shells were set to exploded up in the treetops showering deadly bursts of shrapnel and tree splinters down onto the helpless troops below. The Hürtgen also included two parts of the Westwall, known to the Allies as the Siegfried Line. Originally built from 1938-1939 by 500,000 workers as Germany's largest Public Works program, it was estimated to cost 3.5 billion marks. The Westwall was a hardened defensive system on Germany's western border averaging 4 km miles deep and stretching the whole 640 km of Germany's western borders with France, Luxembourg and Belgium. A German version of France's Maginot line, it started with the concrete "dragon's teeth" anti-tank barrier in a gray line snaking north from Switzerland and was fortified with 14,000 bunkers and pillboxes (over 22 per kilometer) These were put in clusters to provide covering fire for each other. They were built half underground and made of eight to ten feet of reinforced concrete. It was abandoned as unnecessary after Hitler's "blitzkrieg" flashed through the "impenetrable" Ardennes forest and around France's Maginot Line on 10 May 1940. Then in 1944 the Germans frantically refortified the Westwall as the German Army retreated eastward after the Allies broke out of Normandy. They put out rolls of barbed-wire, two rolls high in some places, booby-trapped in others. Machine guns and 37 mm cannon were put in the bunkers. They also put in place thousands of landmines: Teller anti-tank mines, S-mines ("bouncing betties") and the infamous "Shümeinen" (powerful enough to remove a man's foot but no bigger than an ointment box and made of wood or glass to avoid mine detectors). There were even anti-lifting mines designed to catch anyone trying to remove mines. All anti-personnel mines are designed to injure and not kill. That way more men are required to help retrieve and aid the wounded leaving even fewer to fight. The German "sappers" were experts at creating "booby-traps". Trees were cut down and booby-trapped with mines. Shell craters were mined to catch anyone trying to take cover during an artillery barrage. Special deep mines were used that allowed the first tank to drive over without setting it off, then it would catch the next tank. One very large mine field named the "Wilde Sau" ("wild pig") was located in the woods north of Wittscheidt. Aerial photos showed nothing but trees. Maps were nearly useless. Units became disoriented and disorganized almost immediately upon entering the woods. Maneuver and reconnaissance were just about impossible. Support both from artillery and the air was next to impossible since targets could not be spotted. American tanks could barely move on the trails and were easy targets for the Germans who knew where to hit the clearings and trails. If they did reach battle the American tanks and their cannon were no match at all for the German tanks' armor and firepower. It became a terrible battle of men against machine gun nests, mine fields, artillery barrages, tanks and the freezing weather. The burden fell to the infantry to clear the forest using only their M-1 rifles and hand grenades. They did their job but it came at a horrible price. The Germans succeeded too. They held up the advance of the Allies long enough to launch Hitler's surprise attack in the Ardennes on 26 December, the beginning of the Battle of the Bulge. Over a period of ninety days, nine U.S. divisions were chewed up and spit out as the Allied High Command tried to push their way through the Hürtgen with one failed frontal attack after another. The cost to the attacking U.S. First Army was put at 33,000 casualties (24,000 dead & wounded in combat plus another 9,000 victims of trench foot, disease or combat exhaustion). It compares with the casualties suffered by U.S. Marine Corps during their 36-day assault on the island of Iwo Jima, about 26,000. J.F.K. once said, "Victory has a thousand fathers, but failure is an orphan." So it was with this battle. No one was ever held accountable for the costly mistakes that were made here. This tragic battle that everyone wanted so badly to forget was quickly overshadowed by the victory at the Battle of the Bulge. The American General Staff has been largely criticized by historians for this battle. This includes Lt. General Omar N. Bradley, Commander of the U.S. 12th Army Group, Lt. General Courtney H. Hodges, Commander of the U.S. First Army, Major General Leonard Gerow, Commanding Officer V Corps and Major General J. Lawton Collins, Commanding Officer VII Corps and , as well as Supreme Allied Commander Dwight D. Eisenhower himself. Their insistence that the forest be taken by a direct assault even after it proved impossible to provide their troops with artillery, armor or air support proved to have a very high price tag. Also Lt. General John C.H. Lee, head quartermaster for the entire ETO and safely encamped in his Paris hotel, failed to provide the front line soldiers with blankets, winter clothing, overshoes or dry socks. General Lee bears direct responsibility for the nine thousand casualties caused by trenchfoot during this battle. [Here] is a link to an historiographical essay written by Gregory N. Canellis on the Huertgen Forest. In it, he critiques the literature written on the Huertgen Forest and describes the 8th Division's role in the battle. There is also an appendix with the text of the Congressional Medal Honor awarded posthumously to Staff Sergeant John Minick, U.S. Army, Company I, 121st Infantry, 8th Infantry Division. and a bibliography of books on the subject of the Hürtgen Forest. In just the 18 days between 28 November and 16 December 1944, the 3rd Battalion of the 28th Regiment (Buck's unit) lost over 380 officers and men as casualties (43% of their normal strength of 871). But they took 139 prisoners and it was estimated over 700 Germans were killed and more than that were wounded. For their outstanding work in the Hürtgen Forest the 3rd Battalion received a Presidential citation and are entitled to wear the Distinguished Unit Badge. There dont't seem to be any photos from the Hürtgen Forest among the ones I found here. Buck said the woods he fought in were so thick you could only see the two guys on either side of you. 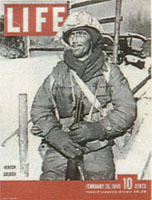 They fought through the winter of '44 - '45, one of the coldest in European history with the temperature going below zero on the fahrenheit scale. They slept out in the mud or the snow often without shelter and Buck once told me none of them ever caught a cold. They went day after day on cold rations since any kind of smoke would attract the German artillery. After the war Buck would never eat Spam, saying he had been forced to eat it cold too many times during the war. In March, he and his buddies crossed the Rhine river on a pontoon bridge next to the captured Ludendorff railroad bridge at Remagen. I think he said it had already collapsed by that time. The Germans attacked the bridge with jet fighters. The 28th Regiment moved on Köln (Cologne) and swung north. Then they went on occupation duty trying to establish law and order in the part of Germany under Allied control. Sometime during all this Buck was wounded by a German tank shell but since he had shed no blood, he did not qualify for a "purple heart" medal [Not so. A bleeding wound is not required for the award according to an email from Lt. Col. Sprengle. I will have to check out the paperwork.] I have posted the V-Mail Vi sent him when he was in the hospital. It is dated 26 April 1945 and is addressed to Pvt. Donald Brener, 3rd Bn.Hq.Com.28th Inf. He was supposed to be shipped home, but slipped out of the hospital and rejoined his outfit to finish his war. On 1 May the 8th Division was sent north to cross the Elbe and protect British Gen. Bernard Montgomery's drive to Wismar, cutting off the Danish peninsula in order to prevent Denmark from being "liberated" by the advancing Soviet Army. The 28th Regiment became a part of "Task Force Canham" under the command of Brig. General Charles D.W. Canham. More than a hundred cities, towns, and villages, including the large air base of Hagenow fell to the 8th Division that day. Buck finally got to see a Messerschmidt jet fighter up close. All along the task force's route of advance large groups of enemy troops awaited surrender. Roads were jammed with steady streams of prisoners. Near the town of Sulsdorf they found a complete V-Bomb assembly plant was with over 60 V-1 bombs ready to launch and enough nitro-glycerine and ammunition to level or badly damage everything within a twenty mile area. Buck saw the liberation of about 2,500 near-starved political prisoners at the concentration camp KZ-Wöbbelin and watched as the people of the town were forced to walk through the camp and bear witness. Near the end of the war a German colonel on horseback surrendered to Buck. Buck got to keep his horse as souvenir. He also got the colonel's saddle, binoculars and holster. In fact, he later told one of his hometown friends that they took the colonel's entire uniform and left him walking down the road in his underwear! Buck somehow found a way to get "his" horse back to the U.S., but the horse had to be slaughtered to feed German prisoners before Buck could complete his scheme. "Task Force Canham" received orders to halt when it reached Lake Schwerin. More than 80,000 Germans came in convoys of motor vehicles, tractors and trailers, horse drawn carts and on foot to surrender. Among them were ten German generals including the 27th Corps commander and his subordinates. The Seventh Panzer Division or what was left of it, totaling 2,500 drove into the 28th's area in their tanks to surrender. They came to escape the Soviets. At least one million German P.O.W. 's died in Soviet captivity as retribution for the estimated 3.5 to 4.5 million Soviet P.O.W. 's killed by the Nazis. The 8th Division linked up with the Russians east of Schwerin, Germany. The war ended in Europe with the unconditional surrender of German forces on all fronts, which was to take effect on 8 May 1945 at 11:01 p.m. Then Buck and the other soldiers of the 8th Infantry Division were ordered to report for months of training in Texas in preparation for "Operation CORONET", the second part of "Operation DOWNFALL", the planned invasion of Japan. The first part was to be "Operation Olympic". During the early morning hours of November 1, 1945 after an unprecedented naval and aerial bombardment, 14 combat divisions of American soldiers and marines were to be landed on Kyushu, the southernmost of the Japanese home islands. On March 1, 1946, after Kyushu was secured as a base of operations, "Operation Coronet" would swing into action. 28 divisions were scheduled to land on the main island of Honshu. Landing to the south of Tokyo would be the troops of the 4th, 6th, 8th, 24th, 31st, 32nd, 37th, 38th, and 87th Infantry Divisions, along with the 13th and 20th Armored Divisions. They were to strike north and east to clear the long western shore of Tokyo Bay, and try to go as far as Yokohama. Yokohama is Japan's second largest city and is 30 Km. south of Tokyo itself. Some estimates called for a combined loss of 1,000 deaths per hour in the initial landings with a final death toll of more than one million. It may have been very fortunate for all of them that the war in the Pacific ended before they were needed. Buck somehow managed to make the trip from Texas back to Wisconsin every weekend. When the war finally ended, he left the service and went home for good. In Aug, 1950, due to the "Police Action" in South Korea, the 28th Infantry Regiment was reactivited, again as part of the 8th Division. It served as a training regiment at Ft. Jackson, SC. But by then Buck had a family and he didn't go. Even though this 2 years was only a small part of Buck's life, it truly was the adventure of his generation. So I just want to say "THANKS!" Thanks to Buck and all the other guys who went away to war as young boys and came back as grown men. And Thanks to the Moms and Dads like Vi and M.F. who let their boys go, waited at home, and hoped against hope that no one would ever stop at their door with a telegram from the War Department. Thanks especially to all those boys who paid the price and never made it back home. We will never know what differences those missing boys might have made if they could have lived out their days in peace. But we do know what a difference they made to what our world is like today.